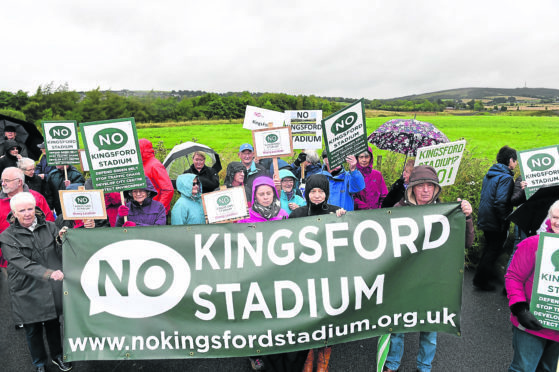 The No Kingsford Stadium group, which raised more than £66,000 for the legal challenge against the 20,000-seater development and associated facilities just outside of Westhill, put forward the petition late yesterday afternoon to the Court of Session. The official deadline for the organisation to lodge a petition was tomorrow. The NKS organisation has highlighted a number of reasons it is opposed to the plans through high-profile campaigning, including concerns over infrastructure, environmental and amenity impact in the Westhill and Kingswells areas. It is understood the legal challenge will claim the planning application for the stadium breached green belt and council development policies. Diane Reid, director of NKS said last night: “We wish to thank all those who have supported us. “We believe Aberdeen City Council has failed in its duty to properly determine this application. “We are confident that the court process will bring independent and impartial scrutiny to the decision, and that we have a real prospect of success. In January, the city council voted overwhelmingly to approve the club’s ambitious project by 32 to 9, and earlier this month Aberdeen FC manager Derek McInnes, as well as club chairman Stewart Milne, officially started work on phase one of the Kingsford Stadium project with a ceremonial sod-cutting ceremony. Construction on the first phase – which is valued at £10 million and will include a training pavilion, groundsman’s accommodation and seven pitches to be shared between the club and its community trust (AFCCT) – are scheduled to commence in October and be complete by next summer. Work on the stadium – at the heart of phase two of the project – will begin thereafter. Once completed, the Dons plan for their new home to include a heritage museum and memorial garden honouring some of the club’s greatest heroes, offices, a gym, a club store and dedicated facilities for the AFCCT. The club hopes to open the stadium in time for the 2021/22 season. It is understood that subject to procedural hearings to determine timescales, if permission to proceed with the NKS legal challenge is granted then a full hearing into the petition would take place within 12 weeks of the courts granting that permission. Raymond Edgar, project director at Aberdeen FC said: “The club has yet to be formally notified of the apparent challenge of the council’s decision to grant planning permission for the community sports hub, training facilities and new stadium. “If a challenge has been submitted, it will be for the court to review the process and determine if there are grounds for a judicial review. “This could result in a delay to these much-needed facilities. Of greater concern however are the costs this will incur for all parties and the damage it will do to Aberdeen’s reputation as a city that is investing in its future. “It is disappointing that a small body of objectors have decided to challenge the decision of the councillors. “Even if they are successful in quashing the permission, the application would simply go back to planning for redetermination and, given the recognised economic benefits of the project to the region, we would fully expect the council to approve the development a second time.